African Mango Extract, found in African Mango, may help you lose weight in conjuction with proper diet, nutrition and excercize. NuMedica African Mango comes from Irvingia Gabonensis, a tree grown in Central and West Africa. This tree produces a fruit similar to a mango. The seeds within contain helpful ingredients that when extracted are provided in capsule form. African Mango seed extract has been shown to help regulate adipogenesis, which is the process of forming fat cells in the body. The African Mango seed extract helps to regulate blood lipid levels. This helps improve insulin sensitivity by supporting healthy adiponectin levels in the body. It has also been shown to favorably impact leptin sensitivity. Leptin is a hormone secreted by the the fat cells and it tells our brain when we have had enough to eat. Our bodies may become resistant to Leptin and we are then less likely to respond correctly to the signals telling us that we have had enough to eat. NuMedica African Mango may help to regulate our appetite by giving us a sense of fullness. Indigenous to the African rainforests of Guinea, African mango is sometimes referred to as wild mango or bush mango and has long been an important source of protein (derived from the nut of the fruit) and nutrients. Although folk medicine practitioners have long held the African mango in high regard, it is only recently that modern science has begun to study its medicinal benefits. Aside from its ability to regulate appetite, research suggests that African mango extract may provide a myriad of healthful benefits. 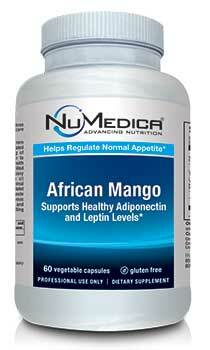 Gluten-free and vegetarian friendly, NuMedica African Mango supplements are available in capsule form. According to research, African mango appears to have the ability to reduce bad LDL cholesterol and triglyceride levels in the blood while promoting healthy levels of the "good" cholesterol that our body needs. Therefore, some people take the supplement to help ward off heart disease. More clinical studies are underway to uncover the extract's full potential for LDL cholesterol reduction. NuMedica African mango may benefit people diagnosed with diabetes. A 2009 study demonstrated that African mango improved blood-sugar levels in patients suffering from diabetes. With its nutritional content, NuMedica African Mango benefits the body with its fatty acids, iron, calcium, and B vitamins. If you are not getting these nutrients in your regular diet, taking this supplement is a great way to help your body get the nutrition it needs. Both the fruit and the nut of the African mango are associated with its nutritional and medicinal properties. Directions: Take one capsule twice daily before meals or as directed by your healthcare practitioner. Other Ingredients: HPMC (vegetable capsule), rice flour, magnesium stearate.